Apple's next-generation iPhone lineup, due for debut in 2018, will build on LTE antenna technology introduced with iPhone X to support ultra-fast transmissions speeds designated by 4x4 MIMO (multiple input, multiple output) standards. In a research note to investors on Tuesday, well-connected analyst Ming-Chi Kuo said Apple will likely upgrade its antenna design to include flexible circuit boards crafted from liquid crystal polymer. Compared to FPCBs made from polyamide, LCP models offer superior frequency attenuation, thermal performance and moisture resistance. Apple currently employs two LCP FCPBs in iPhone X, while the iPhone 8 series sports a single LCP module. Next year, the company is expected to include at least two LCP LTE antenna modules per device, if not more. In addition, the hardware will feature higher specifications to support 4x4 MIMO standards, Kuo says. Though competing handset makers plan to make the transition to 5G, Apple is seemingly content to maximize the potential of 4G LTE technologies. Samsung's Galaxy S8 was one of the first to support Gigabit speeds, notably through 4x4 MIMO, carrier aggregation and 256 QAM offered in some cities by T-Mobile. Current Apple supplier Career, which furnishes about 20 to 25 percent of all LCP LTE antenna FPCBs for iPhone X, is predicted to grow its share of orders to 45 to 50 percent in 2018. Since the firm does focuses on FPCB manufacture, not in-house antenna module integration, it might need assistance from other vendors. Kuo sees Luxshare-ICT and Sunway as the most viable candidates. 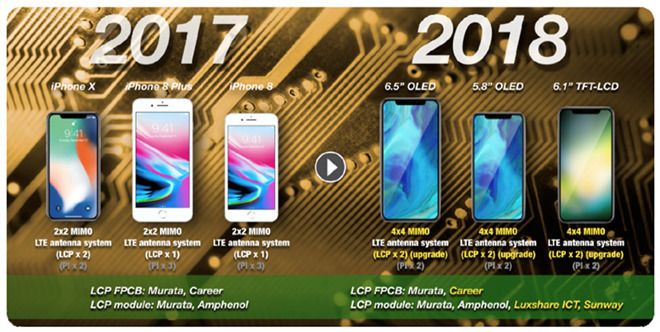 For 2017, Apple's iPhone LCP modules were supplied by Murata and Amphenol, which were integrated into FPCBs manufactured by Murata and Career. Earlier this month, Kuo said he expects Apple to release three new iPhone models in 2018, including a 6.5-inch OLED model that will seemingly serve as an up-sized iPhone X. Apple is also said to be working on a new LCD handset with a 6.1-inch display, a model Kuo believes will be aimed at the low-end and mid-range smartphone markets. Features have yet to be revealed, but the analyst says Apple will likely integrate its advanced TrueDepth camera system in the LCD version as the company moves away from Touch ID to Face ID facial recognition.